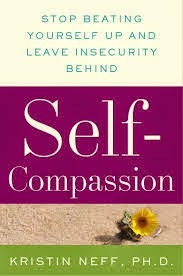 a book chick: "Self Compassion"
my take: Okay, this is a little different review ... Although I think this is definitely worth a read if you struggle with negative self talk or are your own worst critic/enemy ... I'm going to give you the three steps for Self-Compassion so if you never read the book, you'll have the wisdom. For those who can't forgive themselves for their imperfections/mistakes - large or small, life-changing or little every day things - failing to go through these steps can have long-term and unhealthy results. For those of you for whom this is not a problem ~ how great for you! 1. Put your arm around yourself and tell yourself, "It's hard when _________ " Extend to yourself the simple kindness of acknowledging that the situation, mistake, set-back, disappointment is difficult right now. 2. Remind yourself that it's part of the human condition ... when you think you're the only person who feels this way, has made this mistake, has had this happen to them, you forget that essentially we're all in the same human boat and that lots of people have experienced this or SOMETHING. With this perspective and camaraderie you are less isolated and empowered to survive. 3. Figure out the feeling: when you're lost in emotion you're lost. When you're able to name the emotion you can stand beside it and decide if you want to feel that emotion or not. It no longer owns you, which is freeing and a great step toward moving on.